The decision by Russell T Davies, Doctor Who's chief writer and Executive Producer, to destroy Gallifrey was not an attempt to tie in with the continuity of BBC Books' Eighth Doctor Adventures (EDAs), which had already put the planet out of the picture in Peter Anghelides and Stephen Cole's The Ancestor Cell back in 2000. Davies and BBC Books' then Consulting Editor (now Creative Director) Justin Richards arrived at their respective decisions independently, both seeing the need to purge the series of the over-familiarity and consequent lack of mystery of the Time Lords and return some of the uniqueness to the Doctor's character. Initially it appeared as though all of the Time Lords apart from the Doctor had been destroyed, though Lawrence Miles' subsequent EDA The Adventuress of Henrietta Street suggested that four Time Lords (referred to as the four elementals) had survived in total. In Lance Parkin's The Gallifrey Chronicles, these survivors are identified more explicitly: the Doctor; the man with the rosette from Adventuress (i.e. the Master); the Minister of Chance from Death Comes to Time; and a young woman dressed in haute couture, who could be either Romana or Iris Wildthyme. 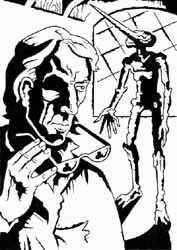 It is probably Iris, because, according to Parkin's EDA Father Time, she visited the Eighth Doctor on Earth, while in The Ancestor Cell Fitz hears gunfire as Romana is surrounded by Faction Paradox soldiers. However, it is worth noting that Iris has often been depicted as something less than or other than a proper Time Lord, and may even be from a parallel universe called the Obverse (mentioned in Paul Magrs' EDA The Blue Angel), so she might not even count as one of the four. However, Russell T Davies' Time War was not the same event that had caused Gallifrey's carefully crafted destruction in The Ancestor Cell. This left BBC Books with a problem: contradict the TV series, or try and tie in with it by somehow resurrecting Gallifrey in order for it to be destroyed all over again. The publisher chose the latter option. This is not the first time that rivalling ranges of adventures have clashed over the fate of the Time Lords. 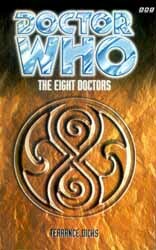 In 1999, two years after Virgin's New Adventures (NA) and Missing Adventures (MA) ranges of Who novels had been succeeded by BBC Books' EDAs and PDAs (Past Doctor Adventures), Lawrence Miles attempted to compartmentalise what he saw as separate and conflicting continuities. Dead Romance, one of the Bernice Summerfield New Adventures that followed the Doctor Who NAs, takes place not in the universe of the former TARDIS travellers Bernice and Chris Cwej, but in a different universe contained within a bottle. Cwej's employers (who, it is implied, are Time Lords) obtain the bottle from creatures known as Sphinxes, and use it to hide out from the powerful "Gods" that have arisen on the planet Dellah. Upon entering the bottle universe, Chris' superiors acquire god-like abilities themselves, thanks to the differing physical laws within. It is theorised that Bernice's universe is itself inside a bottle, and that the Dellahan Gods are beings that entered from outside of it, which is how they gained their awesome powers. The two-part EDA Interference also sees the Time Lords taking possession of a universe in a bottle, this one created by a being called I M Foreman. Once again, it is asserted that the Time Lords gain super-powers upon entering the bottle. The Doctor also notices that there is a version of himself inside the bottle. The implication is that the Time Lords of the EDA universe are the Dellahan Gods of the NA universe - that the NA universe is inside the bottle and thus separate from the BBC Books universe. All very neat. Unfortunately, Miles was in a minority by regarding the Virgin and BBC ranges as separate entities. Virtually every other writer treated the novel series as one big playground and happily cross-referred from one to the other. Gary Russell's PDAs Business Unusual and Divided Loyalties reuse characters from his own MA The Scales of Injustice and Marc Platt's NA Lungbarrow respectively; Justin Richards' PDA Millennium Shock is a sequel to his own MA System Shock; Terrance Dicks' PDA Players ties in with events from his own NA Timewyrm: Exodus; and so on. 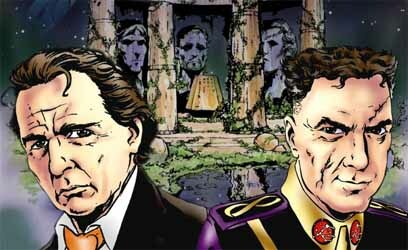 Ultimately, Mark Clapham and Jon De Burgh Miller's Twilight of the Gods, the final Bernice Summerfield NA, threw out Miles' theory about the nature of the Gods by revealing them to be not Time Lords but the Ferutu, Lords of Time from an alternate dimension (who were introduced in the MA Cold Fusion by Lance Parkin). However, if the mythologies of the Virgin and BBC Books Doctor Who adventures, not to mention the bottles depicted in both Dead Romance and Interference, all occupy the same universe, how do we account for the Time Lords needing two bottles? The home world of Chris Cwej's employers is shown to be an abandoned ruin at the climax of Dead Romance, and Braxiatel's people (i.e. the Time Lords) are said, at the end of Twilight of the Gods, to have retreated into their "little bottle" (note the singular). Do they re-emerge and abandon their god-like powers at some point prior to Interference, only to then require another, practically identical, bolthole? If so, why? 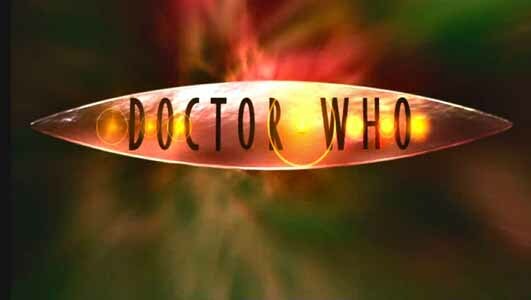 It has been suggested that Chris Cwej's employers are not the Time Lords of Gallifrey but members of Faction Paradox, a creation of Lawrence Miles featured in several EDAs and subsequent spin-off books and CDs from BBV, Mad Norwegian Press and Magic Bullet Productions. However, I feel there is too much evidence to the contrary, even in Miles' own Dead Romance, in which Chris witnesses a meeting between his employers and a race of people from a Dyson Sphere (i.e. the People, who were introduced in Ben Aaronovitch's NA The Also People). 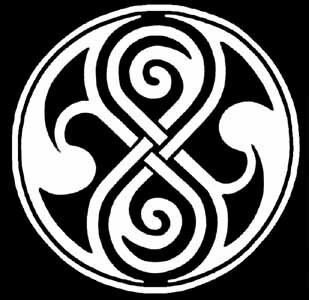 There is said to be a treaty between the two races, which clearly refers to the non-aggression pact that exists between the Time Lords and the People in several NAs. Furthermore, Chris describes an occasion on which his bosses attempted to commit genocide by wiping out a race of time-travelling machine creatures - obviously a reference to Genesis of the Daleks. In addition, in the Bernice Summerfield NA Tears of the Oracle, Braxiatel contacts his own people in order to obtain the assistance of Chris. Therefore, unless Brax is a member of Faction Paradox, Chris' employers are Time Lords. Given their ruthless and nefarious methods, it's possible that Chris' employers are members of the Celestial Intervention Agency. After all, it was the CIA who assigned the Doctor to numerous missions, including presumably the one in Genesis of the Daleks (more on the role of that particular mission in the lead-up to the Time War later...). 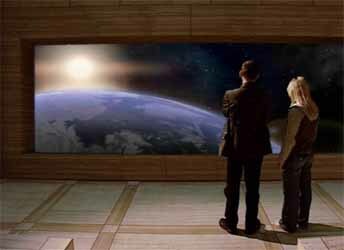 So perhaps the abandoned world shown in Dead Romance was not Gallifrey but the adopted planet of a group of CIA members. However, Brax's reference to his people retreating inside their bottle in Twilight of the Gods goes against this theory, unless Brax is mistaken or he is a member of the CIA. Assuming he isn't either of those things, why do the Time Lords lose their bottle, so to speak? Maybe, following the fall of the Gods of Dellah in Twilight of the Gods, the Sphinxes demand the bottle's return and/or evict the Time Lords, now that the threat is over. Alternatively, perhaps the Time Lords, or at least a large proportion of them, choose to reject the divine powers they have acquired. It is worth bearing mind that the webcast Death Comes to Time suggests that all Time Lords innately possess and used to exercise such abilities, but they set them aside because of the damage they inadvertently caused to lesser beings. It could be that some or all of the Time Lords, having forgotten and/or lost the use of their mighty powers over the aeons, are reminded of them and their dire consequences once inside the bottle universe. Consequently, they leave as soon as they deem it safe to do so. Events in Dead Romance might also explain the relative lack of Time Lords in Death Comes to Time - i.e. all but a few independent types could still be inside the bottle at this point. When General Tannis appears to wipe the Time Lords out, the rest of them could actually be safe and sound inside their bottle and emerge from it at a later date. During the build-up to the war against the unnamed Enemy mentioned in several EDAs, the Time Lords once again seek a bottle - this one made by I M Foreman - for use as a bolthole in case the conflict goes badly. As to why they should seek a different bottle than the one they used in Dead Romance, perhaps the Sphinxes are less co-operative this time around, or maybe Foreman's bottle is simply easier to obtain. In any event, relatively few Gallifreyans enter this particular bottle, which might indicate a newfound reluctance to abandon their home universe and alter their physical natures, except as a last resort. The Gallifrey Chronicles confirms that such bottles are not unique (that is, that there is more than one of them in each universe) by depicting a third. This bottled universe is used by the Time Lord Marnal as a temporal monitoring system, owing to its one-on-one correspondence with Marnal's universe. It has been stated that the war against the Enemy (also known as the War in Heaven) is not the same conflict as the Time War of the new TV series. However, maybe there are connections. At one stage it was rumoured that the Enemy would be revealed to be the Daleks, but rights issues with the estate of Dalek creator Terry Nation prevented that (as they almost thwarted the monsters' return to the TV show). Mad Norwegian Press' Faction Paradox: The Book of the War describes the Enemy as: "Not so much an army as a hostile new kind of history. So ambitious it can rewrite worlds..." The latter phrase sounds not unlike the fallout of the Time War itself, which appears to have left the structure of Time more delicate and mutable than before. "Time's in flux," the Doctor explains to Rose in The Unquiet Dead, "changing every second. Your cosy little world can be rewritten like that!" In Father's Day, the life or death of a single ordinary human being changes the whole world. Like the War in Heaven, the Time War is barely comprehended, if noticed at all, by the lesser (i.e. non time-active) species. The Ancestor Cell shows the Enemy to be something else entirely. According to the hypothesis of Greyjan the Sane, all life in the universe is descended from a single ancestor cell. However, this common ancestor was not the first life to develop. Following the creation of the universe, various exotic life forms existed, which either died out or were eradicated by the Time Lords (as described in the NAs Sky Pirates! by Dave Stone and Christmas on a Rational Planet by Lawrence Miles). When the Time Lords stole Foreman's bottle universe and hid it in the Time Vortex, it began to leak. The energy nourished those early life forms, allowing them to grow and adapt to an environment riddled with chronon decay and paradoxes caused by time travel. According to Greyjan, these creatures sidestepped millions of years of evolution and became the Enemy. However, Greyjan is hardly a reliable source of information, and Lawrence Miles not only disputes this theory but also dismisses Anghelides and Cole's version of Faction Paradox as little more than a parody. Certainly the Faction of The Ancestor Cell have inexplicably transformed from the small but troublesome voodoo cult of Miles' Alien Bodies and Interference, and Jonathan Blum and Kate Orman's Unnatural History, into a terrorist organisation powerful enough to conquer Gallifrey. Miles has suggested that the Faction members depicted in The Ancestor Cell represent a degenerated far-future version of the group. The Faction agents in Alien Bodies are clearly from the Doctor's future rather than the Time Lord present, because in their time the War in Heaven has already started. The Faction in Interference also comes from the future, therefore so must Mother Mathara, a character who appears in both Interference and The Ancestor Cell. The destruction of Gallifrey, according to Miles, is caused by twisted yet powerful "late Faction" agents from farther into the future, who are attempting to change the accepted version of history and prevent the war, whereas everything that happens in the Faction Paradox stories told by BBV, Mad Norwegian Press and Magic Bullet is part of the "old order". This old order might have been erased or shunted into an alternate timeline by events in The Ancestor Cell, or maybe not, depending on whether you wish to integrate the Faction Paradox spin-offs into the same ongoing continuity as Doctor Who. I have a theory that the Faction agents who invade Gallifrey are tricked into doing so by the Enemy. 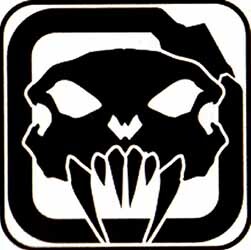 With the war going badly, perhaps the Enemy spreads disinformation about its true nature (the "ancestor cell" theory) to a Faction Paradox cell. Acting on this false intelligence, the agents travel back in time, bringing about the apparent eradication Gallifrey in the process. The object of the exercise, from the Enemy's point of view, is to take Gallifrey out of the equation, paradoxically ending the war before it has even begun. This theory can also be applied if we assume that the Daleks are the Enemy, or, if we wish to integrate the Faction Paradox spin-offs as well, allied with the Enemy. The war could actually be the Time War or, perhaps more likely, one of the Time Wars that preceded it. Alternatively, The Book of the War describes the Enemy as "a process" rather than "a single species, or even a distinct political faction", so perhaps the Enemy is the Time War itself: an aggressive process of historical change that rewrites the universe, sweeping away the Time Lords and the Daleks in its wake. In the episode Dalek, the Doctor refers to "the Last Great Time War," which means there must have been others. It is implied in various spin-off media that there have been several previous Time Wars, but that all traces of them have been removed from history. One such war is mentioned in the NA Sky Pirates!, an ancient conflict fought between the Time Lords and other races, including one known as the Charon. In three Doctor Who Monthly comic strips written by Alan Moore, the Time Lords wage a Time War early in their history against the Order of the Black Sun, which is based some 30,000 years in their future. The first strike of the war, from the Gallifreyans' point of view, is when a Black Sun agent travels back in time and attacks the Time Lords just as they are about to turn the star Qqaba into a power source for their time experiments. This also causes the apparent death of the solar engineer Omega. The Time Lords do not know why the Black Sun would wish to attack them, and theorise that it is in retaliation for something they have yet to do (Star Death, DWM #47, The 4-D War, DWM #51). Years later, at a diplomatic conference, a representative of the Order is murdered by the Sontarans, though the Time Lords are blamed. This provides the motivation for the outbreak of war, since from the Order's perspective, the Time Lords are the ones who strike first (Black Sun Rising, DWM #57). The term "Time War" can be applied to at least two types of time-spanning conflicts in the Doctor Who universe. The first type occurs when two sides engage in conflict across different points in history, as is the case with the war against the Order of the Black Sun. The second type is where Time itself is used as a weapon, with time loops, temporal paradoxes and the reversal of historical events. The Time War of the 2005 series appears to be of the latter variety. The Enemy's alleged "ancestor cell" disinformation strategy seems to employ elements of both types: tricking a third party into travelling back in time to effect a historical change. Panini's Doctor Who Annual 2006 contains an article entitled Meet the Doctor, written by Russell T Davies himself. This article mentions two previous Time Wars, a skirmish between the Halldons (a race mentioned in Terry Nation's We are the Daleks story from the Radio Times 10th Anniversary Special) and the Eternals (Enlightenment, Professor Bernice Summerfield and the Heart's Desire), and the brutal slaughter of the Omnicraven Uprising. On both occasions, the Time Lords stepped in to settle matters. Despite their policy of non-intervention, it is said that the Time Lords regarded themselves - on a higher level, in affairs of the Time Vortex - as keepers of the peace. The article describes the conflict between the Daleks and the Time Lords as "the Great (and final) Time War". It was preceded by numerous smaller clashes between the two races, including a Dalek attempt to infiltrate the Time Lord High Council using duplicates (in Resurrection of the Daleks), and an open declaration of hostility by "one of the Dalek Puppet Emperors" (Davros in Remembrance of the Daleks). However, the Daleks claimed that these attacks were merely retaliation for the Time Lords sending the Doctor back through Dalek history in an attempt to commit genocide (in Genesis of the Daleks). It is claimed that President Romana attempted to open a peace treaty under "the Act of Master Restitution" (probably a reference to the Master's trial on Skaro at the beginning of the Doctor Who TV movie, and possibly also an allusion to Romana's assignment of the Doctor to retrieve the Master's remains at the end of Lungbarrow). However, "the Etra Prime Incident" (the audio drama The Apocalypse Element, in which Romana is enslaved by the Daleks for twenty years) triggered an escalation of hostilities. Meet the Doctor makes no mention of any other Big Finish audio dramas featuring President Romana, such as Neverland and Zagreus, or the Gallifrey series. 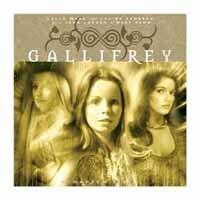 How do these fit into the bigger picture, especially in view of the discrepancies that exist between these stories and various novels, from both the Virgin and BBC ranges, that have depicted Romana and others as Gallifrey's President? Romana returns to Gallifrey from E-Space in the NA Blood Harvest, written by Terrance Dicks. She succeeds Flavia as President in Paul Cornell's Happy Endings and subsequently appears, as does Leela, in the final Seventh Doctor NA, Lungbarrow. However, when Dicks wrote the first of the BBC's EDAs, The Eight Doctors, he overlooked events that had taken place since his own Blood Harvest. 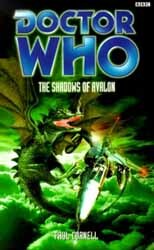 Later EDAs - The Shadows of Avalon, by Paul Cornell, and The Ancestor Cell - returned Romana, in a regenerated form, to her seat of office, so we can assume that The Eight Doctors takes place before Happy Endings so far as Gallifrey is concerned. Dialogue in The Apocalypse Element explicitly indicates that it is possible (though apparently unusual) for Time Lords to encounter one another out of temporal sequence. So far so good, but then Big Finish's Gallifrey-based audio dramas began to deviate from the books that had gone before them. In Zagreus, Romana and Leela appear to meet each other for the first time. This might mean that the story takes place before Lungbarrow, but then the Gallifrey spin-off series gives Andred the familial House name of Deeptree, in Chapter Five - Lies, whereas Lungbarrow claimed it was Redlooms. Andred dies in Chapter Eight - Insurgency, without giving Leela the child she carried in Lungbarrow. The final nail in the coffin of continuity comes in Chapter Nine - Imperiatrix, in which Leela's K9 (Mark I) is destroyed. However, it is possible that the Eighth Doctor audios, and consequently the Gallifrey series that spun off from them, all take place after the BBC's Eighth Doctor novels. After all, we know that Gallifrey's existence is somehow restored at some point between The Gallifrey Chronicles and the Time War. I resisted such placement for a while, because I preferred to assume that The Gallifrey Chronicles occurred close to the end of the Eighth Doctor's lifetime, and I felt that the notion of the planet being somehow "reset" to its pre-Lungbarrow condition was too contrived. However, I have since warmed to the idea, because though the Eighth Doctor novels ceased publication more than a year ago, the Gallifrey audio dramas are more recent and the Eighth Doctor's audio adventures continue unabated. Therefore, it is more satisfying to treat the audios as the newer adventures. This also allows the planet to "live a little" between its two annihilations. The Gallifrey Chronicles reveals that, just prior to destroying his home world, the Doctor, with the aid of his former companion Compassion, downloaded the entire contents of the Matrix (the vast computer network containing the mental traces of every Time Lord living and dead) into his brain. His own memories were suppressed to make room for the super-compressed data. The planet had not actually been erased from history as believed. Instead, an event horizon in relative time prevented anyone from Gallifrey's past from travelling beyond the planet's destruction, and vice versa. Both the planet and the Time Lords could be restored, along with the Doctor's memory, if a sufficiently sophisticated computer could be found to reconstruct them. Wisely (given that the TV show might reveal more information about the Time War at some future date) author Lance Parkin does not specify how Gallifrey is brought back into being prior to the war. However, he provides plenty of clues as to how this might be achieved. He reminds us that the companion Fitz once died but was "remembered" back into existence using Remote technology and with help from the TARDIS databanks (Interference). In a flashback sequence that at first glance appears to bear only a tenuous connection with the rest of the narrative, Parkin also introduces the Network, a gestalt of intelligent software that runs on humanoid brains instead of computers. A combination of Remote, Network and TARDIS technology, perhaps with the application of block transfer computation (Logopolis), operating on a planetary scale, could explain Gallifrey's resurrection. 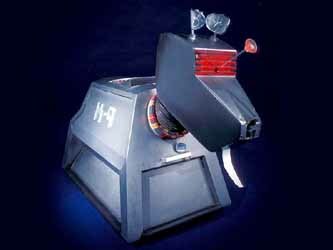 At the end of The Gallifrey Chronicles, the Doctor sends a K9 unit that has survived on board the TARDIS (almost certainly Leela's K9 Mark I) to Espero, the planet he visited in Halflife, probably to track down Madame Xing, who had offered to restore his lost memories. Xing is widely believed to be Compassion, the implication being that she wanted to restore the Doctor's memories in order to effectively destroy the Time Lords, who had once tried to enslave her. Presumably the Doctor wishes to get his memories back after he has rebuilt Gallifrey (he doesn't appear to have any gaps in his memory during the new series), but getting them back from Compassion while still restoring the Time Lords is likely to require some negotiation. Alternatively, it is possible that the Doctor's memories are restored when he regenerates into his ninth incarnation. The discrepancy of Andred's House name could be attributed to a slight error in the data transfer, rather like the TARDIS not putting Fitz back together exactly the same as before. The apparent reversion of Gallifrey to a pre-Lungbarrow state of affairs could be another error in the transfer. Or it could indicate a deliberate bit of tweaking by the Doctor, who, believing the War in Heaven to be over, returns the planet to a happier and more hopeful time in its history, before Romana regenerated into a more corrupt incarnation. Leela is still without child in this version of Gallifrey, though there are hints, in Imperiatrix, that she might one day have carried Andred's child, in another life. Such a restoration could also explain how the Braxiatel on planetoid KS-159 (in the Bernice Summerfield series) is able to communicate with his "past" self in Gallifrey's future (in the Gallifrey series), despite never having been counted as one of the four elementals (Time Lords) that survived the events of The Ancestor Cell. When he leaves his home world, (as told in Chapter Seven - Pandora), he actually leaves the restored version of Gallifrey rather than the original one, and travels back in time to appear in numerous Virgin and Big Finish adventures, and to found his famous Collection (first mentioned in City of Death). How he manages to traverse and communicate across the temporal event horizon described in The Gallifrey Chronicles may be because "restored" Gallifreyans are somehow not affected by this barrier. Certainly Brax is a wily and resourceful individual. Intriguingly, in Panacea, the final chapter of the Gallifrey series, Braxiatel's proposed solution for saving Gallifrey - by re-creating it from stored bio-data - is markedly similar to the Eighth Doctor's plan. The ultimate fate of Braxiatel remains unclear, however. It appears that all of his Bernice Summerfield stories to date take place prior to the Time War. Despite some suggestions that the Time Lords might be back in residence on Gallifrey by this juncture (in the audio adventure Death and the Daleks, Brax ponders the possibility of summoning the might of his people to vanquish the Fifth Axis, while Simon Guerrier's short story "Inappropriate Laughter", in the anthology Something Changed, also seems to refer to Brax's civilisation in the present tense), dialogue in the more recent audio drama The End of the World indicates that "his lot" have not yet emerged from their bottle universe. He informs Jason that: "They've gone their merry way! They don't care - they never did." Unfortunately, Gallifrey seems fated for a devastating war, albeit a civil one in the first instance, while Romana appears destined for corruption. Her ruthless attitude in Neverland echoes that of her third incarnation in The Shadows of Avalon and The Ancestor Cell. In later episodes of Gallifrey, she is tempted by the Pandora entity. 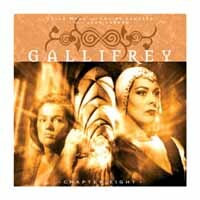 Like The Gallifrey Chronicles, the Gallifrey audio series ends on a cliffhanger. This could mean that some kind of continuation is due, or it could, as with Chronicles, signify that it is up to the reader to imagine what happens next. Like Lance Parkin before him, Panacea writer Alan Barnes leaves us clues as to what might transpire. Possibly informed by his experience of battling the Daleks in Death and the Daleks, Braxiatel warns that something bad is coming, a catastrophe far worse than anything the Time Lords have previously encountered or even imagined. The planet and its people are weakened and ripe for opportunist attack. 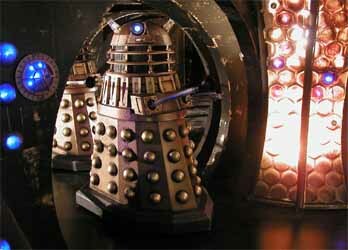 The Daleks get an explicit name check and Mephistopheles Arkadian also mentions some "metal clients". Ultimately, of course, comes the Time War. According to Meet the Doctor, the Time Lords use Bowships (mentioned in State of Decay), Black Hole Carriers and N-Forms (from Russell T Davies' NA Damaged Goods), while the Daleks unleash "the full might of the Deathsmiths of Goth" (from the comic strip Black Legacy by Alan Moore and David Lloyd, Doctor Who Weekly #35-38). Dialogue in The Parting of the Ways suggests that the Daleks consolidate their forces from throughout time as well as space. 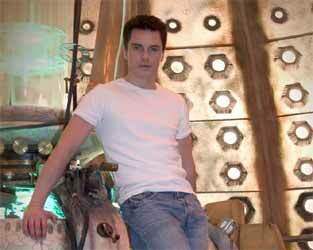 Captain Jack states that: "One minute they're the greatest threat in the universe, the next minute they vanished out of time and space". To which the Doctor replies, "They went off to fight a bigger war. The Time War." This is clearly a violation of the Time Lords' much-vaunted Laws of Time, but it also explains why, after the war, little or no trace remains of the Dalek species at any point in history. In Dalek, for example, the lone survivor scans the heavens of 2012 for fellow creatures but finds none, even though we know Daleks existed in a previous timeline. According to Meet the Doctor, the war goes on for several years. It is waged in the Time Vortex and, beyond that, in "the Ultimate Void" (whatever that is), but the conflict goes unnoticed by the majority of intelligent races in the universe. 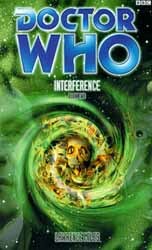 The timelines of the Lesser Species (intriguingly, Davies uses the same term as Lawrence Miles) are occasionally altered by damage to the Vortex, but the inhabitants of the worlds affected remain unaware of the changes, because they were a part of them. Only the Higher Species, those farther up the evolutionary ladder, are able to perceive what is happening. These include the tree people of Cheem (The End of the World), who weep at the bloodshed; the Eternals, who flee this reality, never to be heard from again; the Nestene Consciousness, which loses all its planets and mutates under temporal stress (thus explaining its change of appearance in Rose); and the Greater Animus (The Web Planet), which perishes. 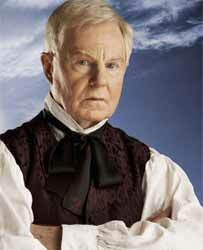 In The Sound of Drums, it is revealed that the Time Lords somehow resurrect the Master in order for him to fight for them as a warrior. 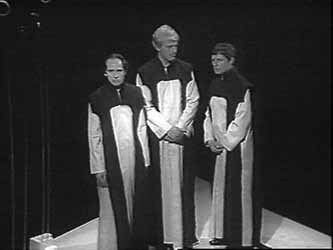 However, he flees in terror before the conclusion of the war, after the "Dalek Emperor took control of the Cruciform". Taking on human form, he hides himself at the time of the universe's heat death, where no Time Lord had ever ventured before. Just one man walks free from the ruins of Gallifrey: the Doctor. Evidence suggests that the Time Lord himself causes the planet's destruction, probably under desperate circumstances similar to those in which he found himself at the end of The Ancestor Cell. In Dalek, he claims that he was responsible for the devastating conflagration that wiped out the Daleks: "I made it happen," but he also states that the Time Lords "burned with" them. In The Impossible Planet, the Beast refers to the Doctor as a "killer of his own kind". At some point between the Eighth Doctor audios and Rose, the Doctor evidently regenerates, though the circumstances of this event have yet to be documented. 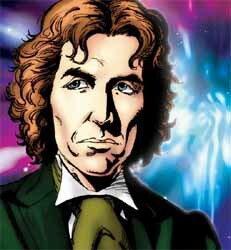 It is tempting to assume that the Eighth Doctor meets his end heroically defending the innocent during the Time War. A scene in Rose in which the Doctor looks in a mirror and declares: "Could have been worse. Look at the ears," suggests that he has only recently changed. However, the Ninth Doctor must have been around long enough for Clive to amass all his documentary evidence of this incarnation's solo travels. It's possible that the Doctor regenerated quite some time ago but, owing to his guilt over his actions in the war, he had been unable to face his own reflection until now. This could be part of the overall process of rehabilitation that we see taking place over the course of the 2005 series of Doctor Who. 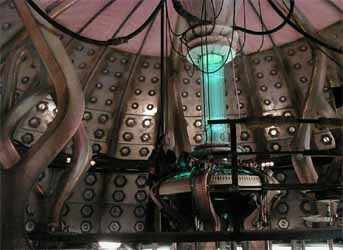 The TARDIS interior also undergoes a change during this time. The Gallifrey Chronicles suggests that the ship's new, less cluttered look in Rose is the result of damage. A fusion device detonates inside the vessel, destroying its contents, including bric-a-brac observed during various previous adventures: the books and the bookshelves, the antique furniture, the candles, the kitchen, the food machine, the fault locator, the lamps, the hat stand, the shaving mirror, the carpets, the ormulu clock, the full-length mirror, the tea set, the wine rack, the chess sets, the gramophone, the butterflies, the tool kit and the cuddly toys. The TARDIS swimming pool is boiled dry, the ivy in the cloisters is vaporised and a wardrobe the size of an aircraft hanger is burned clean. Fitz's room, including all of his records and souvenirs, are also incinerated. The actual fabric of the TARDIS is largely undamaged and is able to repair itself. However, the Eighth Doctor audios, which I have placed after The Gallifrey Chronicles, reflect the sounds and (on their back covers) the look of the TV movie interior. 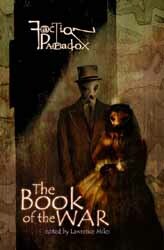 Furthermore, the novels had already deviated from this design. When the TARDIS is restored at the end of Escape Velocity, it appears more cosy and homely than its previous cathedral-like look, with wooden roundels on the walls and a replica of the kitchen from the Doctor's house in Kent. It would seem that the TV movie version of the ship's interior has come and gone before. The Big Finish audio drama The Settling suggests - rather contentiously - that the Seventh Doctor redecorates his vessel immediately prior to that story, which uses sound effects from the TV movie. This contradicts several other stories: practically the whole of the NA series; Gary Russell's novelisation of the movie; and even Big Finish's own The Sirens of Time, which uses 1980s-style TARDIS sounds. I theorise that the Settling makeover is a temporary one and that the vessel, perhaps accidentally, reverts to its white décor at some point prior to the NAs. Similarly, it could be that the TV movie look is something that the TARDIS can return to quite easily. Perhaps, having accidentally lost the design prior to the NAs, and having gradually and painstakingly re-created it before the TV movie, the Doctor saves the pattern, rather like a restore point on a computer. This could explain its reversion between The Gallifrey Chronicles and the Eighth Doctor audios. The ship's new look from Rose onwards could indicate battle damage incurred during the war, the non-availability of Gallifreyan spare parts, or simply the Doctor's desire for a change. Below is a speculative chronology of the major events in recent Gallifreyan history, taking into account the television series, Virgin New Adventures, BBC Books novels, Big Finish audio dramas and Doctor Who Magazine comic strips. Blood Harvest (Virgin Books) Flavia is President. 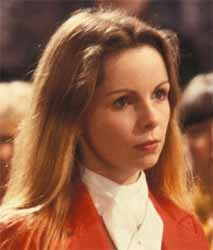 Romana returns to Gallifrey. Romana succeeds Flavia as President. Happy Endings Romana meets the Doctor out of sequence. Romana vanishes on Etra Prime (see The Apocalypse Element). She is replaced by a retired male President (possibly Niroc from The Eight Doctors). Where Angels Fear (Virgin Books) The Gods of Dellah rise. 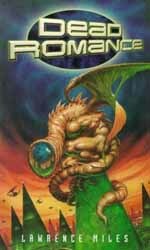 Dead Romance (Virgin Books) The Time Lords obtain a bottled universe from the Sphinxes, intending to use it to escape the Gods. The majority of the Time Lords escape within the Sphinxes' bottle. Death Comes to Time (BBCi webcast/BBC Audio) The few Time Lords remaining in their own universe are wiped out by Tannis. Twilight of the Gods (Virgin Books) The Gods of Dellah fall. 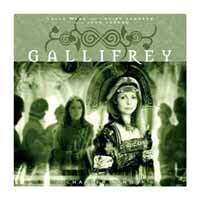 The Apocalypse Element (Big Finish) Romana returns. She meets the Doctor out of sequence. 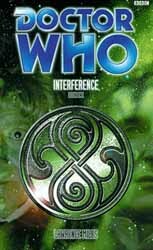 Interference (BBC Books) Fearing another war, this time against the unnamed Enemy, the Time Lords steal Foreman's bottle. 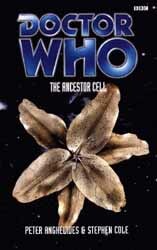 The Ancestor Cell (BBC Books) Gallifrey is apparently destroyed. Gallifrey is restored, probably using a combination of Remote, Network and TARDIS technology. The planet reverts to a pre-Lungbarrow state, due to an error in the transfer or deliberate tweaking by the Doctor. The War in Heaven and/or the Time War is waged. Perhaps the two are synonymous, or perhaps one follows the other. Gallifrey is destroyed. I am indebted to the online resources provided by the Doctor Who Reference Guide (www.drwhoguide.com), Outpost Gallifrey's Canon-Keeper's Guide to Doctor Who (www.gallifreyone.com/guides-canon.php), the Whoniverse's Discontinuity Guide (www.whoniverse.org/discontinuity) and the wonderful Wikipedia.